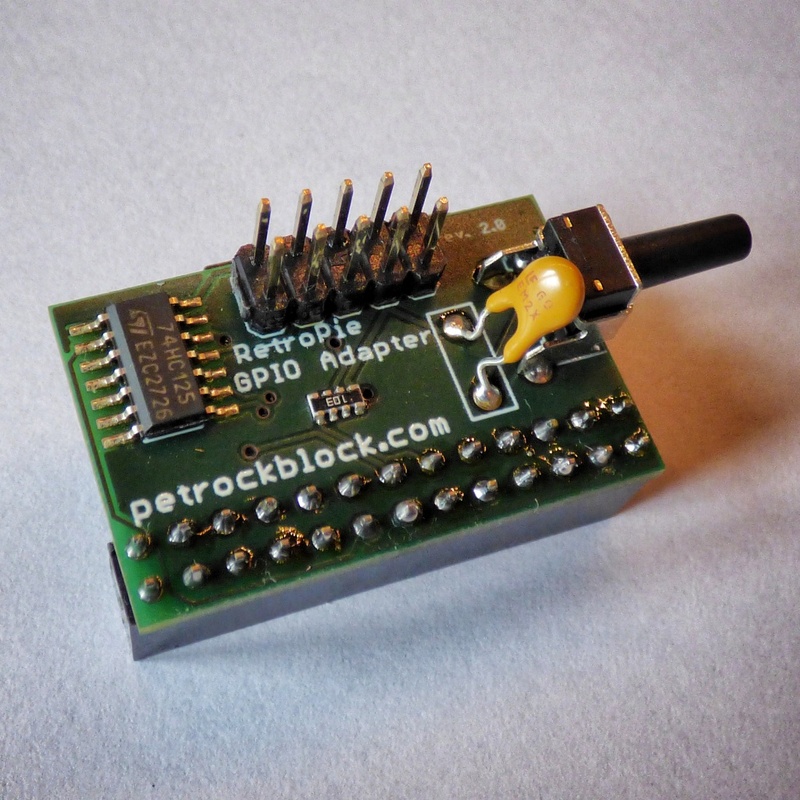 UPDATE: The RetroPie GPIO Adapter is replaced by the ControlBlock, which supports more controller types and provides even a power switch functionality. The ControlBlock is has its own page here. If you want to use your Raspberry Pi for gaming you certainly want to attach some sort of controller(s) to it. Since the Raspberry comes with two USB ports one way would be to simply attach any sort of USB gamepad or joystick via these ports to it. Besides the configuration this approach has the disadvantages that one or both USB ports become occupied and, what I think is even more disturbing, that an active USB hub might become necessary to provide enough energy to the controller(s). Also, if you want to get the real retro feeling you certainly want to use original controllers. 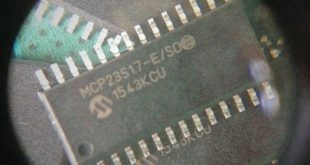 The GPIO pins of the Raspberry allow the communication with all sorts of hardware and attaching, for example, SNES controllers can be done in quite a few steps. A user-space program that polls the controller(s) in the background was presented here. 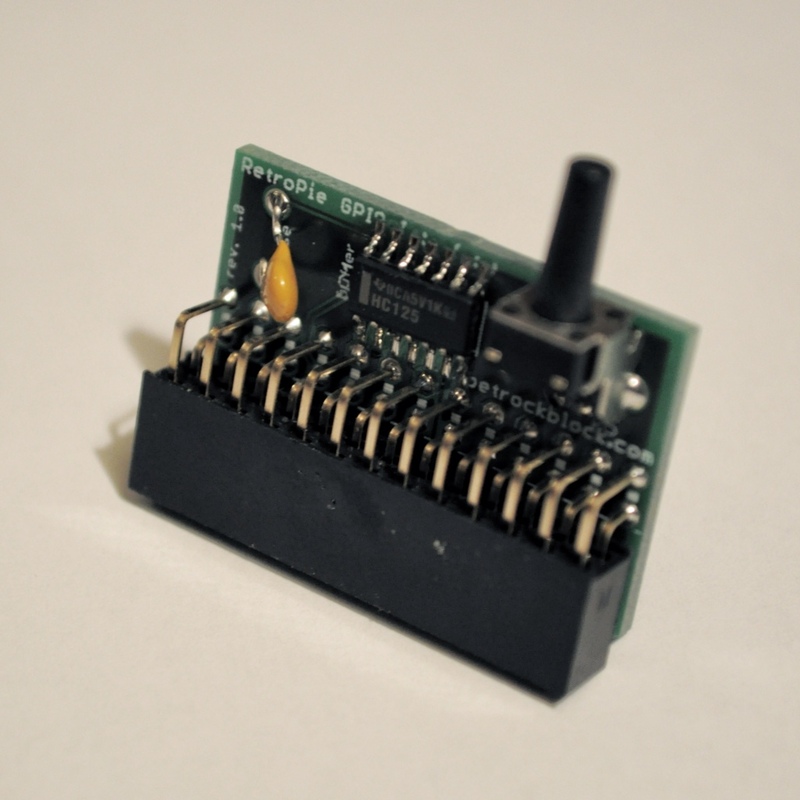 In the following I am presenting a dedicated GPIO adapter for the Raspberry Pi that allows an easy and safe connection of up to two NES or SNES controllers. Based on the experiences with a previously presented adapter PCB I designed a new SNES adapter PCB specifically for the use with the Raspberry Pi. Update 28.09.2014: Revision 2.0 of the RetroPie GPIO Adapter is released! The functionalities of revision 2.0 are exactly the same as the previous revision. However, the hardware design has changed due to the Raspberry Pi (TM) model B+ design. In contrast to revision 1.X, the new RetroPie GPIO Adapter revision is now mounted horizontally on the RPi. In the following descriptions of the adapter, photos of both revisions will be shown. 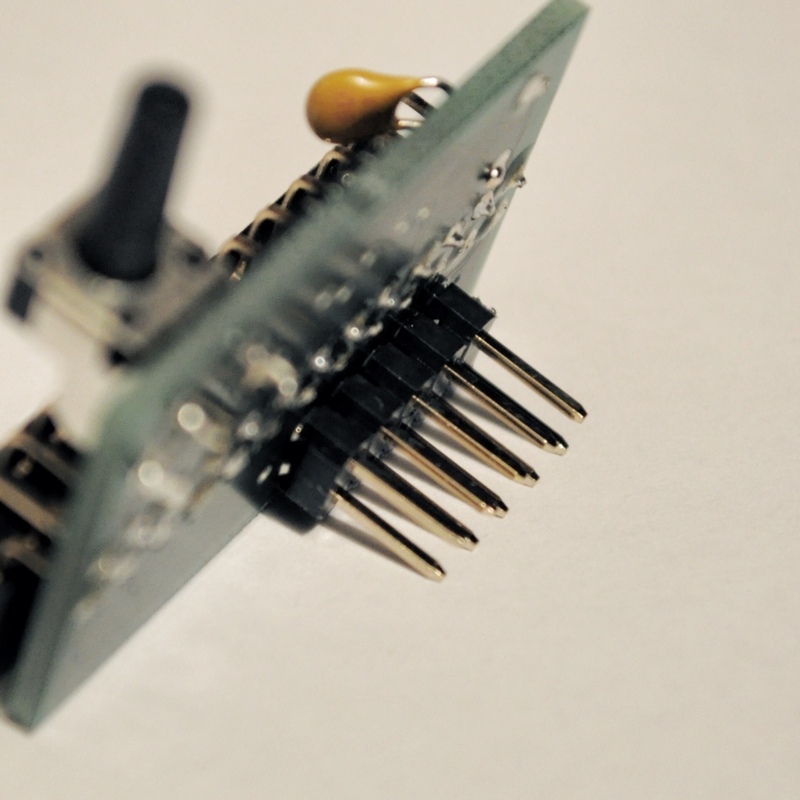 An easy and practical installation of the adapter board is achieved by using a 2×13 pins female header for a connection to the GPIO pins and 2×5 pins male header for the connection to, for example, (S)NES controller sockets. The only tinkering needed for a connection to (S)NES connectors is the soldering of the ribbon cable to the connectors. The size of the adapter PCB is only 0.91 in x 1.32 in (23 mm x 33.5 mm). This size does not increase the needed overall volume of the Pi much and allows the usage of most existing cases. A word to SNES sockets: One way for obtaining these is to use the ones from SNES extension cables. Alternatively, a community member published 3D models of the connectors here. 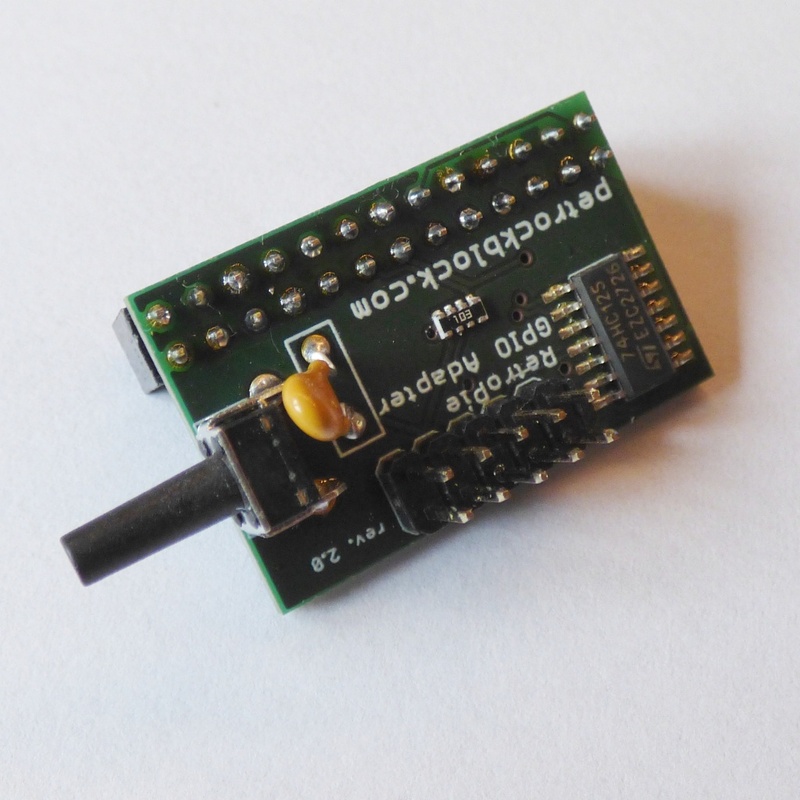 For a practical application the adapter is provided with a circuitry protection as it was proposed in a thread of the official Raspberry Pi forum. To handle over currents a resettable fuse is put on the supply rail. Possible transients are taken care for by a buffer IC 74HC125. As stated by RPi wiki site about circuitry protection these ICs provide an in-line connection which is buffered via an internal transistor switch to isolate the input from the output. 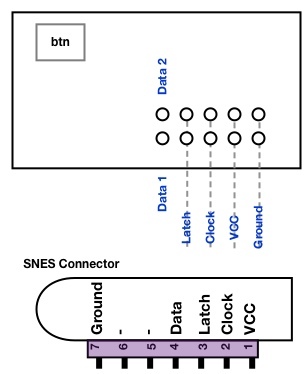 Four GPIO pins, which would correspond to two data lines, the clock, and the latch in case of (S)NES controllers, are buffered by the adapter. A momentary on push button is also part of the adapter board. 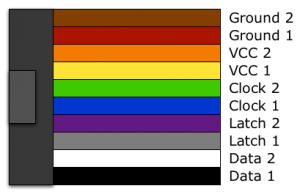 The button is also connected to one of the GPIO pins and, thus, the status of the button can be polled with any suitable software. This allows, for example, to add a reset/back button that is needed with a keyboard-less setup and controllers with no redundant buttons like the SNES or NES controllers. Ribbon cable connected to revision 1.X of the RetroPie GPIO Adapter. Ribbon cable connected to revision 2.X of the RetroPie GPIO Adapter. Schematics and assembly Guide: You can find the schematics of the RetroPie GPIO Adapter revision 1.X and assembly guides here. A comprehensive guide for getting started with the adapter can be found in this post. 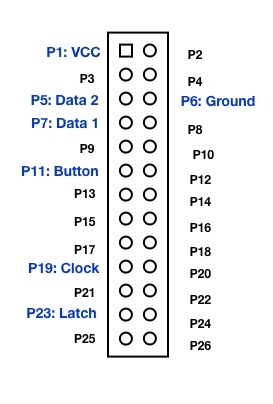 Additional GPIOs on revision 1.X: It can also be seen from the schematics that revision 1.1 of the adapter breaks out four additional GPIO pins (GPIO pins 0, 14, 21, 22) together with ground and the 3.3V pin. This provides the possibility to attach additional hardware to the GPIO and use the RetroPie GPIO adapter at the same time. Note, however, that these additional pins do not provide any circuitry protection. 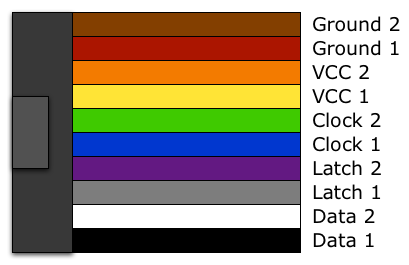 The dimensions of the adapter revision 1.X match the ones of the PetRockBlock PIE case. This means that both can be combined with each other to build a keyboardless gaming console with the RPi at its center. 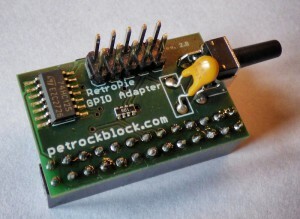 The RetroPie GPIO Adapter revision 2.X has a different hardware design is not compatible to the PetRockBlock PIE case. In order to use the RetroPie GPIO adapter a driver is needed that reads the states of the controllers and the button and maps these to the input system of the operating system. This can be done in kernel- or in user-space. The SNESDev software is an example of an user-space application that interfaces with the controllers and the button on the RetroPie GPIO Adapter. It is recommend to use SNESDev as driver for the adapter board. if you connect external hardware to that pin, the worst that will happen is it falsely triggers safe mode. and saving the changes with “Ctrl-X”, which has to be confirmed with “Y”. A video of the adapter in action can be found in this post. 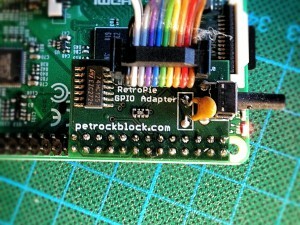 You can find a complete getting-started guide for the RetroPie GPIO Adapter on this page. will test the first and the second game pad. If you are using SNESDev for polling the game pads you need to use the option “poll game pads and button” in the menu of the RetroPie Script. If everything ism assembled and set up correctly button presses on the game pads will act as keyboard input and you will see according outputs on the console. A long press (more than 1 second) on the button will lead to a key press of “r” which, again, can be checked on the console. The RetroPie GPIO adapter allows an easy and practical connection of NES and SNES controllers via the GPIO pins of the Raspberry Pi. The size of the adapter is kept as small as possible and should fit into most existing cases. It contains circuitry protection against over currents and transients. Furthermore, a momentary push button is installed on the adapter that can be used, for example, as a back or reset button. The pin out of the GPIO male header is matched to the already existing gamecon RPi GPIO driver, which can easily be installed and updated with the RetroPie Setup script. 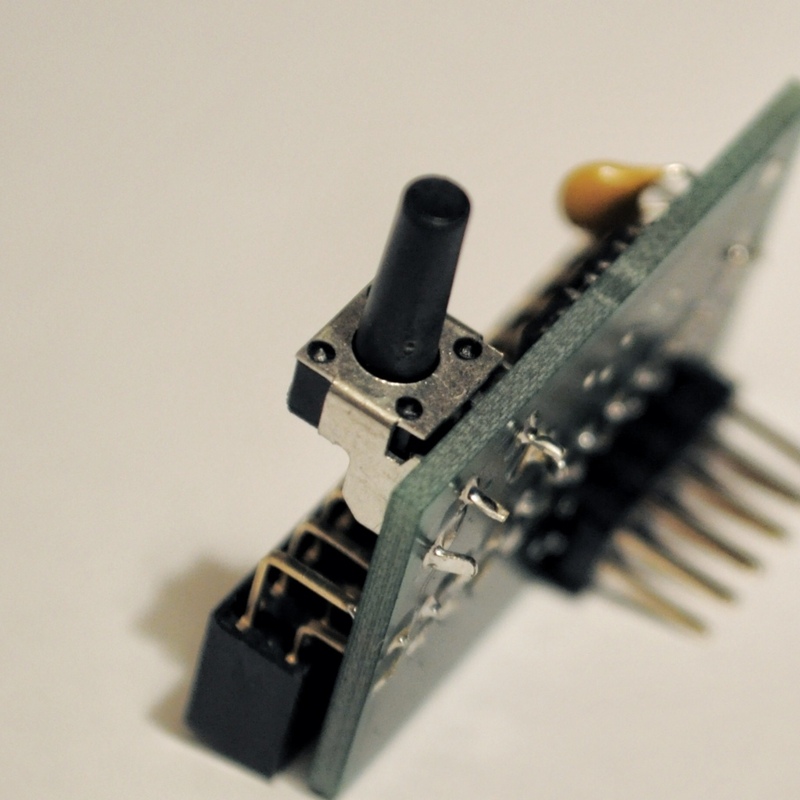 If you are interested in an adapter please have a look here. The RetroPie GPIO Adapter kit also includes a ribbon cable (about 10 cm long) and a ribbon crimp connector. Is there any way to get one of these?? Been OOS for over 4 months(that I’ve been checking). I bought a retrolink USB snes controller adapter, that the pi won’t recognize. Exuse me, can i use my pis plain old letter keyboard? If i get the GPIO adapter, would I be able to connect an original NES Zapper, ie. to play Duck Hunt, Hogans Alley, etc. I know I can hook up the hardware, but does the SNESdev driver support it, and does it work as expected? I was not aware of the fact that rev 1.x adapters were still sold. I will have a detailed look into this. I am experiencing strange behavior with two original snes pads. I didn’t use the adapter, but the pinouts described in the article. In the game both pads work as expected. BUT when trying to configure the controller for emulationstation only one of the two pads is recognized on port one. If I interchange the pads so that pad 2 is connected to port one it is not recognized by emulationstation. Has anyone an explanation for this behavior? Is there a way to interface with an Atari joystick? Something like a CX40 or compatible? I’m most interested in emulating a C64 and would like to use my old controllers if possible. The Atari CX40 Joystick is super easy — you should be able to just hook it up directly to the IO of the PI, with maybe some pull-up resistors, otherwise it should be the simplest controller in the world to interface with, since it’s just buttons going directly to wires (with a common on one side). 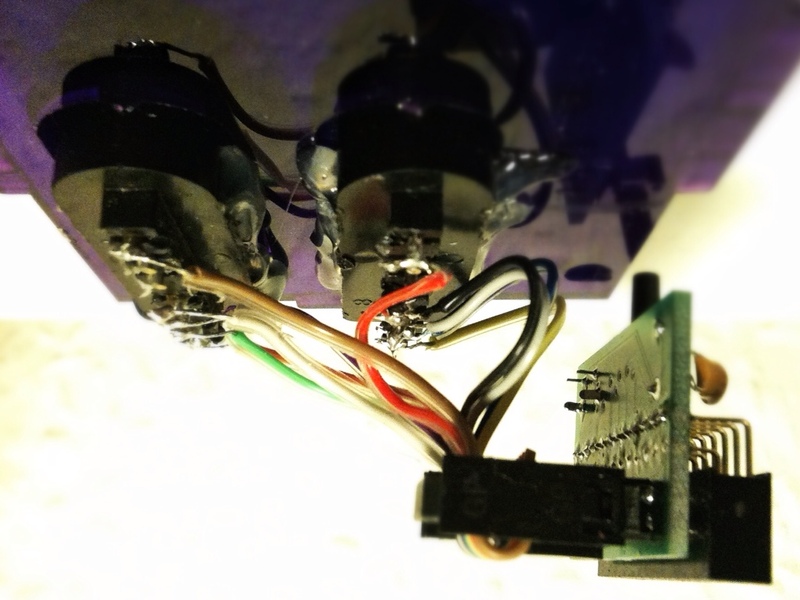 — You should be able to hook them up the same way you hook up discreet arcade buttons (for like a PI based MAME cabinet) for example. The NES and SNES ones shown here are also similarly easy, they’re basically one step up from that, in that they use shift registers to latch and then pass the data back in serial. — Otherwise, they’re basically the same thing.